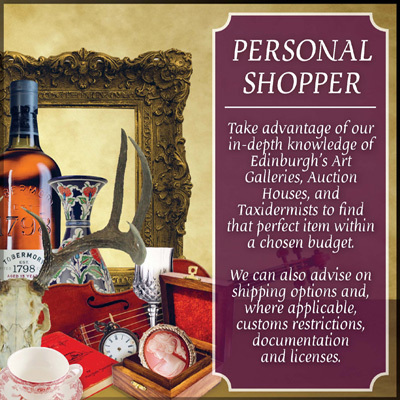 Take advantage of our knowledge of Edinburgh’s Art Galleries, Auction House, Antique Dealers and Taxidermists. We’re in a unique position to help with the purchase of anything from Antlers to works by renowned Scottish artists such as Peter Howson, JoLoMo, John Bellany, who/what else? We’re experts in the packing and shipping of Art and Antiques and can work within any budget. Minimum charge And can provide and all in quote including the item, packing and fully insured shipping of the item to you anywhere in the world.